The crater is named after Giovanni Battista Riccioli, an Italian Jesuit astronomer who introduced the system of lunar nomenclature that is still in use today. He was also the first person to measure the rate of acceleration of a freely falling body. 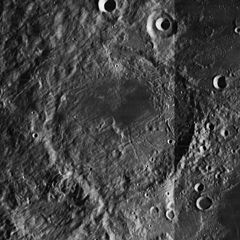 By convention these features are identified on lunar maps by placing the letter on the side of the crater midpoint that is closest to Riccioli. Riccioli Crater: Cracked, Melted, and Draped, LROC, Posted by Jim Bell on February 04, 2010.